The method follows procedure given in international standard ISO 9705:1993(E), and in NORDTEST method NT FIRE 025/ISO 9705:1993. The side walls, the rear wall and the ceiling of a test room with length 3.6 m, height 2.4 m and width 2.4 m are covered by the surface material to be tested, i.e. a total amount of 32 m2 surface material is needed. The ignition source is a propane burner placed in one of the rear corners, and the heat output is 100 kW for the first 10 minutes, and 300 kW for the next 10 minutes. Total testing time is 20 minutes. 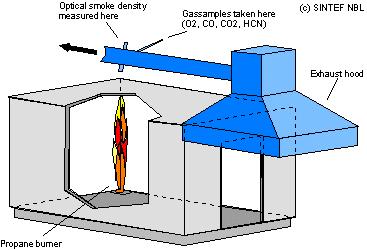 Combustion gases are collected during the test by an exhaust hood for further analysis. This gas analysis makes it possible to calculate heat release rate and to assess production of toxic gases from the specimen. Smoke production is assessed by measuring attenuation of a light beam by smoke in the exhaust duct. The attenuation is related to volume flow, resulting in a quantification of smoke density called smoke extinction area [m2/s]. The flames shall not spread further downwards than 0.5 m from the floor, except for the area within 1.2 m from the corner where the burner is placed. For materials of class A, only a few burning drops or burning pieces are allowed to fall down in the area 1.2 meters away from the corner where the burner is placed. Class A corresponds to properties for products classified as In1 according to Norwegian standard NS 3919. Class B-E correspond to properties for products classified as In2 according to Norwegian standard NS 3919. The criteria below are given in IMO Res. MSC.40(64): Standard for qualifying marine materials for high speed craft as fire-restricting materials. No flaming drops or debris of the test sample may reach the floor of the test room outside the area which is within 1.2 m from the corner where the ignition source is located.